I suspected there to be a line at the door when I opened it at 8am. Crickets. I couldn’t believe it! Every other weekend there were at least 3 people standing on our lawn a half hour before we opened. Surely they wouldn’t be able to pass up a deal like this! Maybe it was too much of a deal and everyone had low expectations of the product. Finally, 3 minutes later one lone man wandered in and started looking around. “So, I can take anything I want? Even this A/C? How about this tent? And this? Gee, I feel weird taking all this stuff! Why is no one else here?” That guy did a number on our junk, and ended up giving us an extra $20 just because he felt that it was the right thing to do. We had about 11 people come through in the 3 hours we were open and we only had 1 load to take to the Salvation Army – our house is [almost] empty! It feels so good to have some space again. 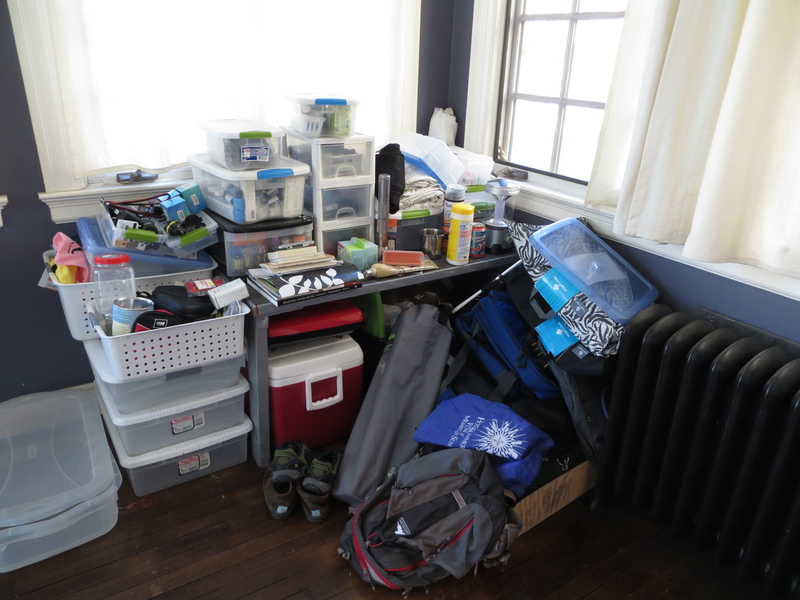 I sectioned off a corner in the sunroom months ago where I’ve been piling up all our gear. At first it was camping gear, then I gathered all our bathroom stuff, and then it was the kitchen, and now Tom has all his clothes packed. All in a heaping pile, with a sheet draped over it hiding it from nosey yard-salers. It’s time to unveil the treasures that rest there, time to fit everything into its proper bin or bag, the last stop before its final home in the truck. From the start our plan was to be done working March 1st and leave end of March/Beginning of April. Then my pregnant bff came home from Hawaii and was due on April 22, so that adjusted our date a bit. But then! … after a nice walk in the zoo with my friend – POP! the baby came that night, 3 1/2 weeks early! So with Mom and baby on their way home from the hospital, we find ourselves with no more of a plan than ever, again. There’s nothing keeping us here anymore!